Gowns have become a must-have bridal outfit. 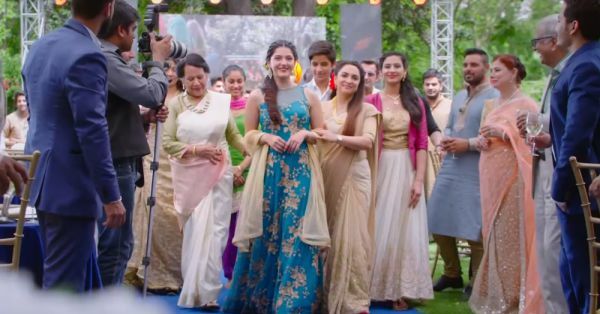 A lot of brides opt for gorgeous voluminous gowns for their engagement ceremony and why not, gowns make sure that you look spectacular on your special day. So, dear brides-to-be, if you too just got fixed and will soon be hitched, here are a few stunning options we’ve picked out for you. These 15 engagement gowns will make you look like a million bucks! This maroon off-shoulder gown with a fishtail cut is one of the most glamorous looking outfits we’ve seen in a while. 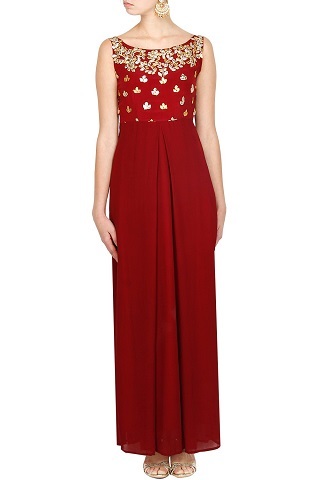 The sequins work will make you shine on your engagement night and a deep maroon lipstick will look just perfect. Price: Rs 19,900. Buy it here. Peach is such a pretty colour and so perfect for your ring ceremony. The floral embroidery is absolutely charming and the net dupatta gives it just a touch of indo-western. Bright lips and a stylish clutch will set you apart. Price: Rs 13,175. Buy it here. The silver metallic embroidery and the one-sided cold shoulder design makes this gown look oh-so-stylish. The colour is so fab, and styled with a messy bun, it sure will make you look like a million bucks. Price: Rs 12,950. Buy it here. We love the pastel purple colour! It is so, so pretty and an outfit like this is perfect for your dreamy engagement ceremony. 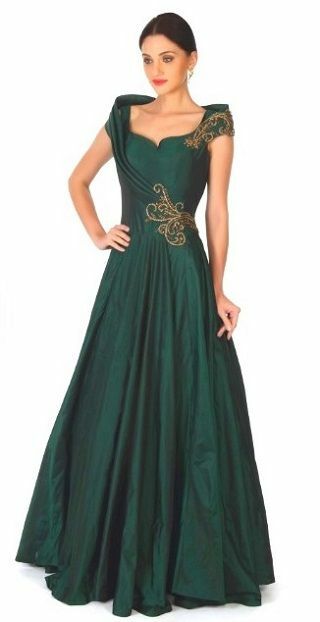 For the girl who likes to keep it nice and subtle, this gown is a must buy. Loose curls and smokey eyes will complete your look. Price: Rs 13,963. Buy it here. Want to keep it classy and fashionable? 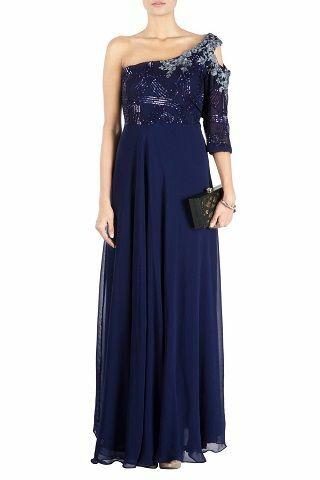 Opt for this teal gown that features sequin and dabka work on the collar and sleeves. Understated and elegant, this outfit is sure to fetch you a lot of compliments. Price: Rs 19,800. Buy it here. 6. For the love of capes! Capes are the thing right now and your engagement is the perfect occasion to sport this style. A baby pink gown with a floral embroidered cape, this is just so stunning. Chunky earrings with colourful gemstones will complement the gown extremely well. Price: Rs 18,900. Buy it here. 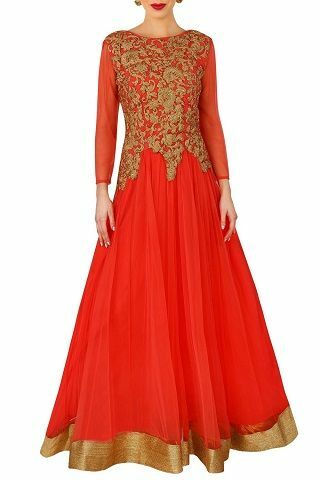 This heavily embroidered coral gown is perfect for the girl who wants a royal look for her ring ceremony. The gold embroidery stands out and it’s also a great buy if you don’t want to show off too much skin. Price: Rs 13,750. Buy it here. 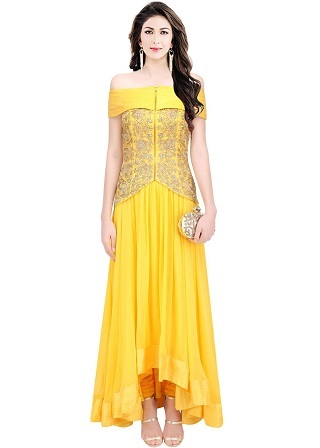 This charming yellow silk gown is embellished with sequins and zari, and we love the hi-low design that makes it stand out. The vibrant colour and the offbeat style makes it perfect for the bride having a day ceremony. Price: Rs 19,565. Buy it here. 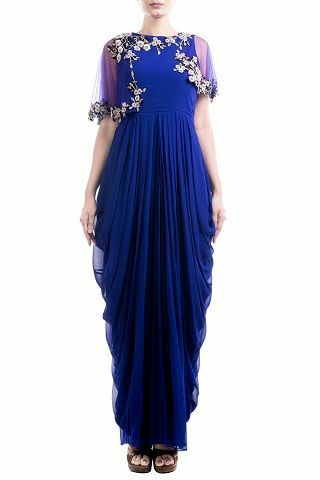 For the bride who likes to keep it different, this indigo blue dhoti gown with cape sleeves is a fab pick. Pair it with bold makeup, chandelier earrings and sleek strappy heels. Price: Rs 12,500. Buy it here. God, this is love at first sight! 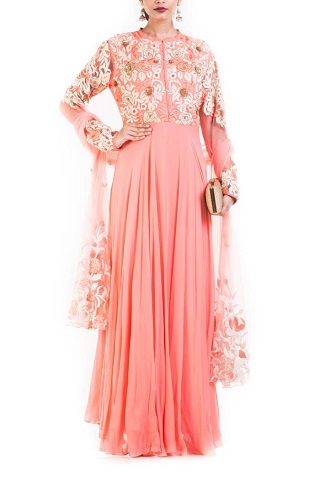 A stunning pink gown, we love how beautifully it falls, the slight ombre effect and the delicate embroidery. The neckline is absolutely flattering and a pair of statement earrings will complete your look. Price: Rs 16,900. Buy it here. Having an intimate ring ceremony? 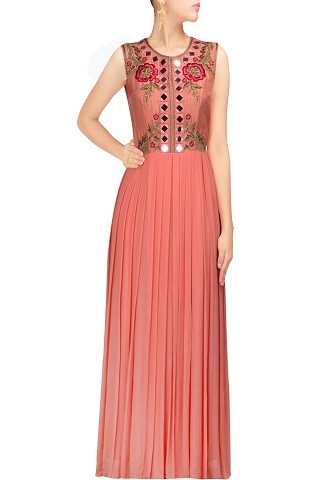 Opt for this pink pleated gown that features minimalistic yet stunning mirror and thread work. Gold earrings, a statement ring and a stylish ponytail will make you look wow! Price: Rs 20,000. Buy it here. Such a unique, gorgeous design! 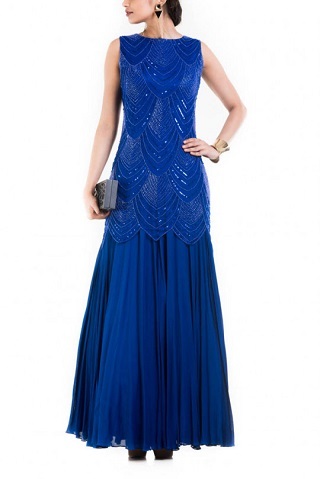 A glam blue shade with dreamy sequins and a flattering fall, we are in love with this outfit. A nice berry lip colour and statement earrings will complete your look. Price: Rs 19,500. Buy it here. An off white-cream gown, this one’s a class apart. White has emerged as a popular shaadi colour and this net gown with gold embroidery looks so very beautiful. 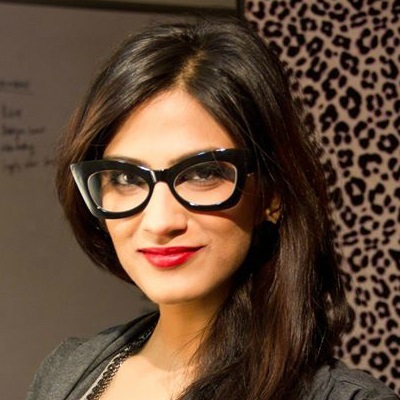 Go in for a light lip colour for the day and a deep maroon for the night. Price: Rs 16,140. Buy it here. Ooh, this is so attractive! Looks straight out of a Disney movie! The colour is glam and so is the design. Love the neck and the voluminous fall of the gown. A wine lip colour will go oh-so-well with these beauty. Price: Rs 15,540. Buy it here. A maroon gown with gota patti work on the bodice, this is such a pretty engagement outfit. For a fusion look, wear it with chaandbalis and delicate bangles. Price: Rs 15,000. Buy it here. All these gowns are just so gorgeous! Which one do you plan to buy? !